This is UK season 14, if you're counting. John Barnaby (Neil Dudgeon) is the new DCI in town, taking over where his cousin Tom Barnaby (John Nettles) left off when he retired. John Barnaby is formerly from Brighton and still has a lot to learn about the country ways of Midsomer County. DS Jones (Jason Hughes) is a local lad grown up in the area and teamed with the new inspector. He was also teamed with the former DCI Barnaby. Between them, they try to figure out whodunit, how and why...which is not always easy. One of the fun aspects of this series is that by now, I think the body count must be over 200 and yet the writers keep finding new ways to kill off people. You can usually count on two or three bodies per episode. As with any long-running series, when you start making major cast changes, you run the risk of alienating the viewers and the new mix may lack the needed chemistry to pull off the changes. Happily that is not the case here. I am quite comfortable with the new DCI Barnaby and dare I say it? I don't really miss the old one. I do miss Dr. Bullard (Barry Jackson) the coroner when Tom Barnaby was around but I understand the need to make a clean break from the old, well established series characters by introducing fresh new characters to the revised, continuing version. Kate Wilding (Tamzin Malleson) turns in a more than adequate performance as the new coroner. I still don't care for Barnaby's wife Sarah (Fiona Dolman) but I like the dog Sykes. I'd be happier if Mrs. Barnaby had a smaller part (perhaps talked about but not seen) and Sykes had a bigger part. There are four episodes in this set (which is called Set 22 in the U.S. and Canada). It contains half of the UK episodes from Season 14. 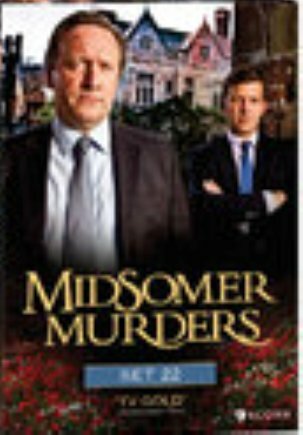 If you are already a fan of this series you will continue to enjoy the haven for murder that is Midsomer County. If you are new to the series, you can join right in the fun with this DVD set. You don't have to start at the very beginning. Although to be fair to new viewers, as I've mentioned in previous reviews of this series, not all of the previous episodes are great. I prefer the very early episodes to some of the middle and later ones. Every now and then the series seems to run out of steam. But I'm happy to say that the cast changes seem to have gone smoothly and the new characters are fitting right in to the mix of murder and mayhem in the English countryside that is Midsomer. the altar stone. Early bets are the local druids are to blame. "The Night of the Stag": The May Festival in Midsomer Abbas seems to bring out the worst in some of the villagers. dwindling community of nuns wondering what will befall them next. suspects the murders may not really be about the rare bird sighting but rather about a cheating and pregnant wife. Copyright © 2013 Over My Dead Body! All rights reserved. Reproduction in whole or in part in any form or medium without express written permission of Over My Dead Body! is prohibited. OMDB! and OMDB! logos are trademarks of Over My Dead Body!